I’m on vacation right now. I’m counting this as a “pleasure” blog and not a “work” blog. And also I’m bragging. Why am I bragging you ask? Because I got to read Dark Tomorrows by J. L. Bryan before it’s released. You may ask yourself, “What is the significance of this? Who is this J. L. Bryan you speak of?” And the answer is: my new favorite author. But Dark Tomorrows is brilliant. It’s sorta like a literary Twilight Zone. I’ve only had a chance to read the first three stories, but they were really fantastic. I only meant to skim them to get an idea of what he was writing, but once I started to reading, I just kept reading. I’ll give a more detailed review later, because I really should be doing things around the house and wrapping Christmas presents. Full disclosure: Bryan sent me Dark Tomorrows because he’s asked me to contribute a short story. I had a very hard time doing that, because he’s a much better writer than me, and I didn’t want to slog down his anthology with my crap. In conclusion – if you have not read Jenny Pox, go do it now. Dark Tomorrows should be out soon. I’m not sure when, but I think I was holding up the release date. So soon. Also, my friend Daniel Arenson has a new book out. It just went on sale today. It’s called The Gods of Dream. The description that I stole from his website sounds very David Bowie. (Yes, I’m using David Bowie as an adjective). Some think dreams are figments of our mind, but they are wisps of a distant, magical world… a world that can be visited. 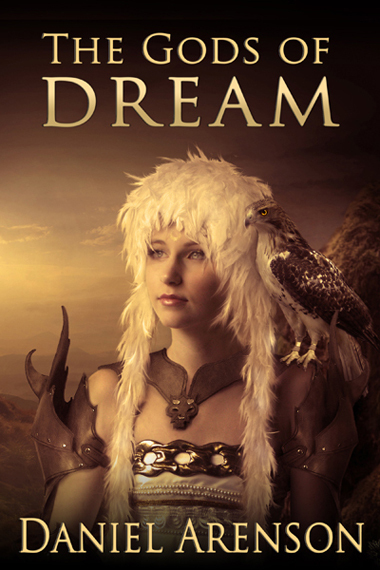 Twins Cade and Tasha discover Dream, the land dreams come from. It is a realm of misty forests, of verdant mountains, of mysterious gods who send dreams into our sleep. Cade and Tasha seek solace here; they are refugees, scarred and haunted with memories of war. In Dream, they can forget their past, escape the world, and find joy. Phobetor, the god of Nightmare, was outcast from Dream. Now he seeks to destroy it. He sends his monsters into Dream, and Cade and Tasha find their sanctuary threatened, dying. To save it, the twins must overcome their past, journey into the heart of Nightmare, and face Phobetor himself. Discover a world of light and darkness, of hope and fear, of dreams and nightmares. Discover The Gods of Dream. Look at how gorgeous the cover is. Now go buy the book. It’s only $2.99 and perfect for that Kindle you/your loved one/your worst enemy is getting for Christmas. Awww, thanks Amanda! You couldn’t be any kinder. I really like the two shorts you contributed, and I’m sure your readers will, too. You’re such a great storyteller!